Shindaiwa is a company specializing in high-performance outdoor power equipment for the manufacturing, landscaping and forestry industries. While its product line is directed at professional use, the company enjoys widespread popularity among home consumers interested in professional grade equipment. One of its products is the 488 chain saw, a lightweight saw popular with home consumers. The Shindaiwa 488 chain saw weighs 10.2 pounds without bar and chain. The 50:1 fuel ratio is gasoline and 2-cycle engine oil. The fuel tank can hold up to 20.2 ounces, and the oil tank holds up to 10.1 ounces. The available bar length is 16, 18 or 20 inches. Additional accessories for this chain saw include a heavy-duty pro filter system. Different bars are also available, including the 16-, 18- and 20-inch Pro Lite DG/0.325 inches. 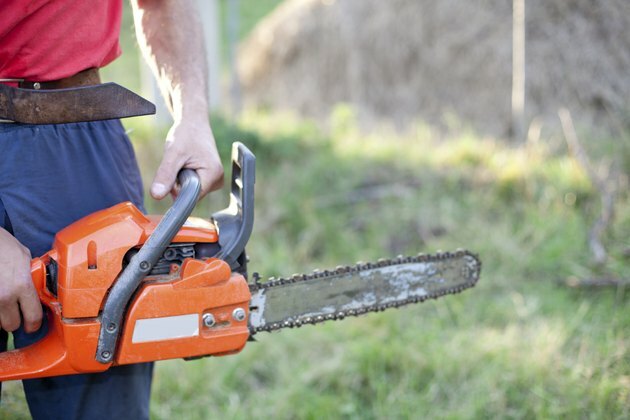 The engine displacement of this chain saw is 47.9 cc, or 2.92 cubic inches. Engine displacement refers to how much volume pistons can push through the cylinders in a single movement. The chain saw has a two-ring piston and a rim sprocket. This Shindaiwa two-cycle, high-torque engine produces 3.5 horsepower of output power. Shindaiwa 488 chain saws feature Walbro carburetors and a five-point anti-vibration system, which reduces user fatigue. A rubber-coated chain catcher keeps the chain from dropping off saw. The chain oil pump is adjustable, and the ignition consists of a single piece and a four-bolt muffler. The 488 includes a chain brake to stop the chain from hurting you if the chain saw kicks backwards. It also features two handles for a better grip on the machine and hand guards to protect you when operating the saw. Always wear gloves, protective clothing and safety goggles whenever using power equipment.